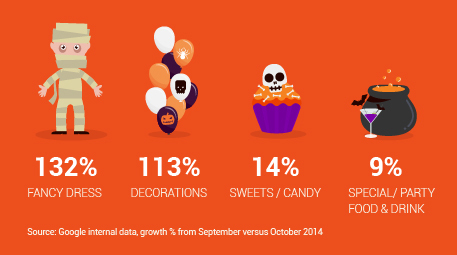 Home » Nonsense » What Is This Obsession With Halloween? As the father of two young kids, inevitably I get exposed to the marketing assault on Halloween each year. Whilst I can’t comment with any conviction on what things were like in the UK more than a decade ago (before I had children and when, frankly, I probably didn’t either notice or care) and I know that it’s always been a much bigger deal in the US than over here, there is little doubt in my mind that Halloween has significantly grown in prominence as an annual event in recent years. Aside from my fellow marketers (I’m as guilty of this as the next person) leaning on this event with ever-greater intensity, this has set me thinking as to whether there are any other interesting social driver behind Halloween’s growing acceptance? Fireworks aside, Halloween has clearly been commercially exploited far more than Bonfire Night in recent years. I guess that’s because there are more obvious opportunities for direct, personal participation with Halloween, ranging from companies supporting their employees dressing up, to events aimed solely at adults (I mean, who wears either this or this really? And why?). In any case, although fireworks are about as fun as it gets IMHO, I guess one would have to grudgingly accept that it can be fun to do the whole dressing up bit, not least because of the simple tried-and-tested formula: costume + booze = total temporary personality revamp (ahem) that gives licence for all sorts of mischief. Also, I reckon that middle aged nostalgia effect is at work here, in more than just parenting – specifically because everyone (*) loves a zombie. People of my advancing age do tend to look back very fondly on films like Evil Dead, Nightmare on Elm Street or even the cheesy-yet-terrific Scream series. The Walking Dead has been a soaraway TV (and comic book, of course) success of recent years and now we’re all desperate to combine Tough Mudder with 28 Days Later, in events such as http://www.zombieearth.co.uk/. So, we’ve accepted zombies with open arms in recent years. 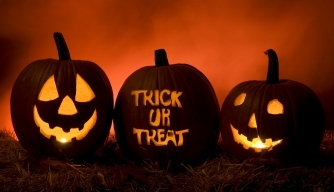 The thing is, I didn’t do trick or treating when growing up – nor do I know many people that did. So, unless Pester Power really has become a global force for change, I don’t think that kids’ love for sweets is the cause. So, the conclusion that I’ve come to is that because alcohol and fireworks don’t mix well under any circumstances, because we all (sigh) love to dress up and because the long stretch between the summer and Christmas is just too much for us to bear without something in the calendar to lift the spirits, Halloween looks set to continue to grow in appeal. In any case, I’ve downloaded the beautiful It’s The Great Pumpkin, Charlie Brown app and will be taking a copy of Texas Chainsaw Massacre to watch with a group of mates at a friend’s house tonight. I’ll probably leave the face paint and plastic accesories to the initiated though, at least for for the time being.